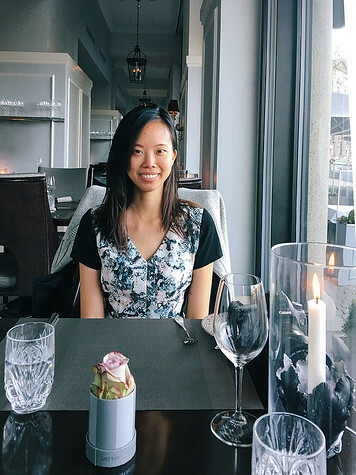 There are so many restaurants in Copenhagen (the city has a fantastic food scene) that we had a hard time choosing which restaurants to try. 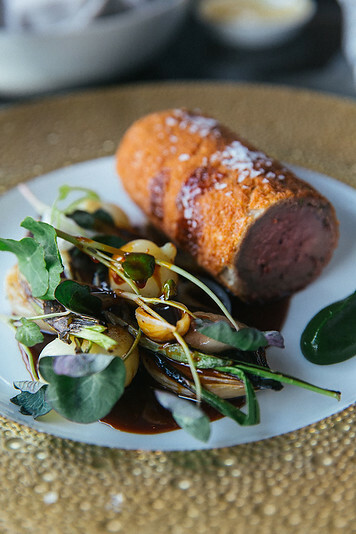 Ultimately, we couldn’t pass up the chance to try one of Denmark’s best restaurants during our visit – Marchal, a one star Michelin restaurant located in Copenhagen’s Hotel D’Angleterre. D’Angleterre is one of the oldest, most luxurious boutique hotels in Copenhagen, founded in 1755 and the stylish restaurant is decorated in a classic black and white motif. After making reservations for an early dinner, we arrived hungry and eager to experience the best of Copenhagen’s food scene. 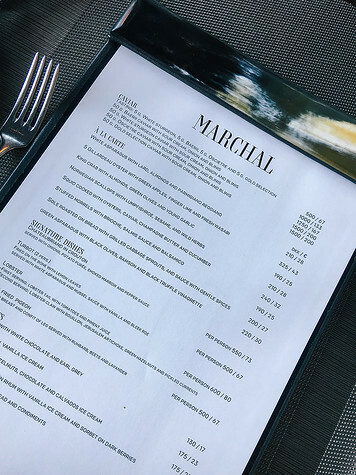 Marchal is located on the ground floor of D’Angleterre and tables have a light filled view of bustling Kongens Nyrtov square. 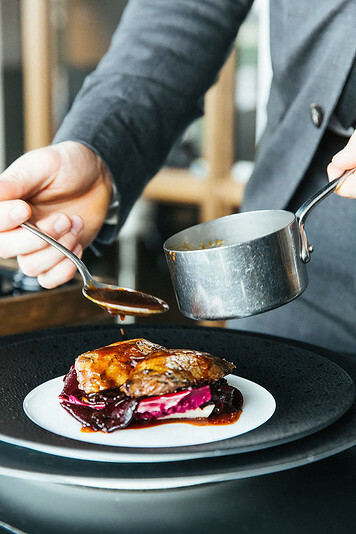 The Kobenhavn restaurant serves modern, Nordic-style cuisine with a classic French undertone and we noted the extensive wine list and caviar collection. I especially loved the dinnerware, which were a variety of gleaming white, gold and matte black circle-embossed plates. The menu offers a range of small plates and our waiter recommended choosing 3 to 4 items from the menu. More on our dinner below! 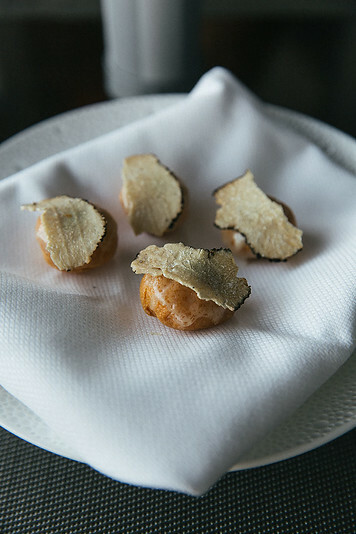 To start, we were greeted with an amuse-bouche of truffle-topped, cheese-infused popovers. They were miniature, piping hot and sumptuously delicious. 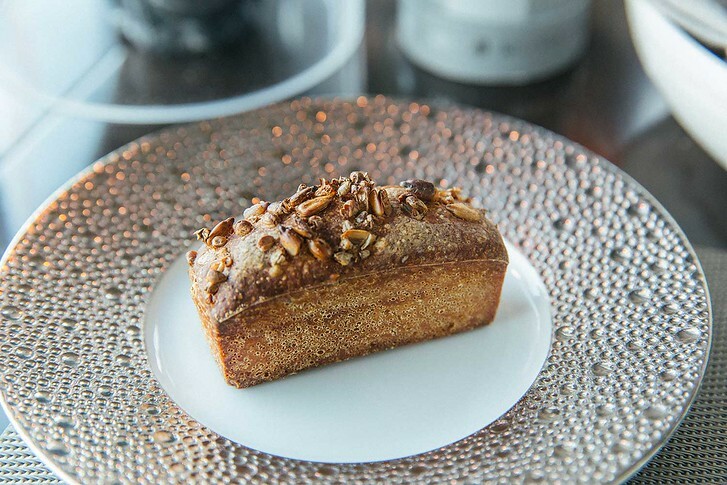 Next, we had some fresh Nordic nut bread, served with a creamy rich butter. 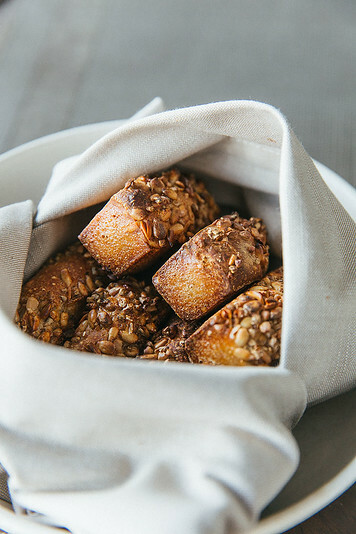 I loved how they were baked in individual mini loaves! For our appetizers, we tried the squid and Norwegian scallops. 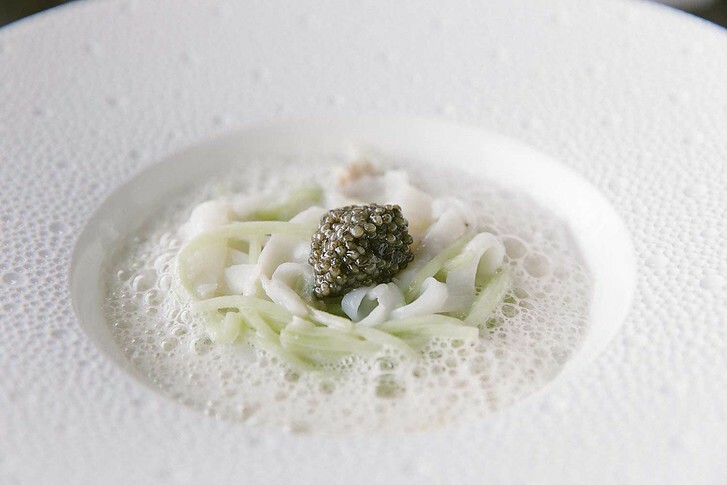 The dish was served in long squid and cucumber noodles nestled in a champagne butter foam with a heap of caviar to crown the “pasta”. It was rich yet light at the same time. Meanwhile, the scallops were served raw, sashimi style which was unexpected! 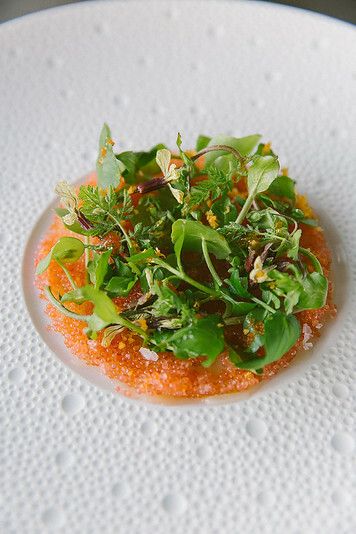 The plate was buried in lumpfish roe and wild herbs, accented with sesame. The result was a crunchy and tart burst of seafood in each bite. 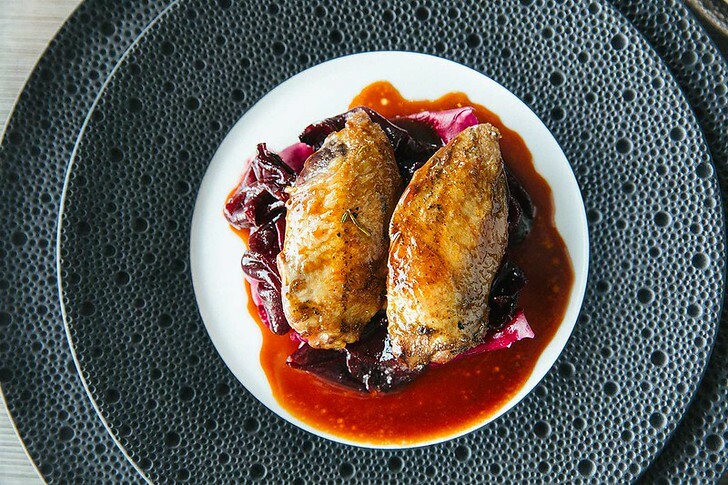 The signature dishes at this Copenhagen restaurant feature a strong french influence. 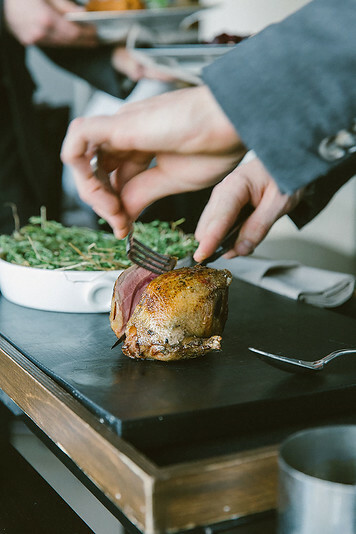 For our mains, we ordered Marchal’s Chateaubriand steak and fried pigeon. My tenderloin filet was served in a crouton pastry alongside savory onions and potato puree, drizzled with a pepper sauce. I really loved how rich and smokey the veggies were! 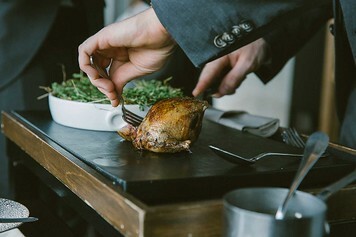 Our waiter brought out the entire pigeon, showing us the bird’s cook and preparation. Afterwards, he carved the breast and legs table side. The legs confit were crunchy and delectable and the breasts were coated in a sticky rhubarb and lavender sauce alongside crunchy rhubarb. Overall, the top quality ingredients and rich flavors left us quite satisfied! 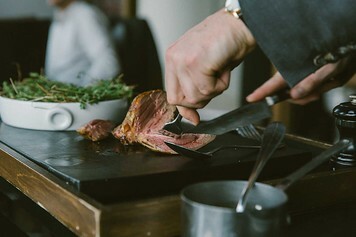 If you’re looking for a luxurious restaurant in Copenhagen, Denmark reserve a table at Marchal! 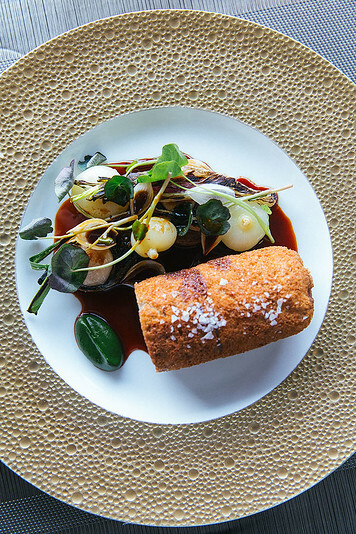 Have you tried any Michelin starred restaurants in the city?